You know how sometimes you find yourself randomly clicking and realize that you have about 24 windows open and you start closing them and you’ll see something that piques your interest and you’ll click on it and then all of a sudden you have 53 other windows open and you can’t even remember what you were looking for in the first place? Well… firstly, of course I’m exaggerating about the numbers here and secondly, this was supposed to be an intro to get you to read this old post of mine from Old One Wink at a Time and I got sidetracked way back, like halfway through the first sentence. PD has taken it upon himself to aid me in the frightful task of smoking cessation (mine). He subscribes to the school of thought that the very best way for me to quit is to allot me a certain number of the cursed things cigarettes each day, tapering off until I’m smoke-free. This week he’s kindly counted out 15 cigarettes each day and sends me out in the world with that much ammunition. Next week he’ll arm me with 14 per day and so on and so on. I hesitate to even post this information due to the fact that you wonderful people have heard so many different versions of this song and dance routine that I’m sure you’re thinking, “Yeah, right. Here we go again…” Yeah, well, you’re gonna hear it- and if and when I fail again, you can say “I told you so” but you can say it to yourself because if you say it to me I’ll cry. And then I’ll try again and you’ll have to read about it again. And so on. I have to confess that I’m not exactly buying this method one hundred per cent. And I’ve been honest with PD about it. The times that I’ve tried this method before, what happens is this: by the time you get down to say, 5 cigarettes per day, those five cigarettes become the most important thing in the world and that’s all you can think about. I feel like I wrote this before and if I did, I apologize. But that’s what I’m expecting. In the mean time, I’m working on getting more exercise and drinking voluminous amounts of water. (Not entirely sure if I’m using voluminous correctly, I looked it up [honest I did, it’s somewhere between volcano and vomit in the dictionary] and I’m still not sure. Anyway, I’m drinking gallons of water. And trying to occupy my mind with prayer/song lyrics/plots to murder people who stress me into lighting up. So. I guess the plan is that 14 weeks from now I’ll be smoking one cigarette per day. That ought to be quite an entertaining time to read here. 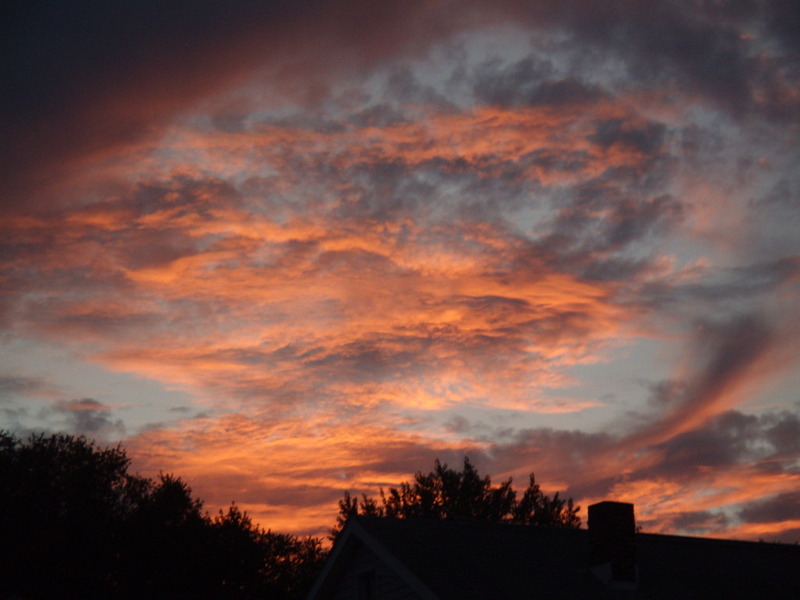 And just because this page needs some color, here’s a recent sunset behind our house that I like. A lot. We’ve had our DSL back all day and I carried with me in my travels a happy little sense that when I got back home I would be able to catch up on all of your collective news and answer my mail. On Day One of our garage sale, which was advertised to commence at NINE O’CLOCK AM, I was busy finishing setting up in the garage at 8:10 am with the garage door still closed, when I heard someone come up the driveway. First I thought that the closed door might be a good sign that we weren’t “open” for business yet and the earlybird may have left. Not the case. PD had been adamant when the subject came up, and no, we wouldn’t give in to those “vulture types” (my words, not his) and let them rush us before we were ready. So I went outside and informed the white-haired woman clutching her little change purse that we were not yet ready for shoppers. She looked a little indignant and informed me that she would just look around. I politely told her that she wouldn’t be able to buy anything until 9 o’clock and she was welcome to come back. She promptly planted her hands on her hips, eyes flashing, and said quite plainly and with great conviction, “Well, YOU are an ignorant person!” She turned on her heel and marched away. No, I didn’t see that coming. And I still can hardly believe that something so ridiculous could cause a person to make such a pronouncement to another. What is it with people anymore? Now on to something that could possibly make you a little squeamish. < That is your warning. Last night I agreed to sit with a friend’s two little ones so that he and his wife could go out for a couple of hours. It just so happened that they’d gotten a new puppy and their cat had had 4 4-week-old kittens (had had 4 4!!) and so I found myself with not just two little girls but six animals in my charge. The puppy is still being potty-trained so I took him outside a couple of times. He’s a little thing, so I scooped him up and started in the house when the mama cat came flying out of nowhere and high-tailed it out the door. She ran across the porch and I wasn’t sure if she would go under the banister, so I ran after her and reached down under her front legs to grab her. Well. That was not in her plan. She freaked and scrambled to get out of my grasp and all I saw were paws flailing wildly and then I felt the pain in my finger. By the time I realized that her claw had not only pierced the bottom fleshy part of my index finger, but had gone clear through and come out the other side, (I know!) she was hanging by just that one claw from my finger. It was completely surreal when I realized what was happening. Oh and yeah, it hurt like hell. Now all I can think about is the gazillion cat germs that are probably multiplying inside my finger… I doused it with soap and water and peroxide, and then put antibiotic cream and a band aid on it. I figure it will have to be amputated at some point. PD said a current tetanus shot will probly not do me a lot of good. I hope you caught The Kings of Leon on SNL tonite. Great band. PD and I spent about an hour today picking up three wheelbarrows full of sticks which were strewn all over the back of our yard, mostly under the cherry tree. My legs hurt already. I’ll not be able to get out of bed tomorrow. A Happy Birthday to my little sister Hazel today. Love ya! I will say, however, the show was FABULOUS.